The Blick 999 Model II incorporates many features of the new, larger Blick Master Etch Model II press, but at a very economical price. 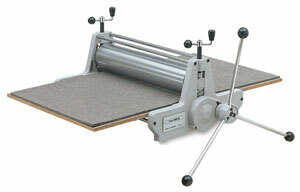 Built for studio or classroom use, it makes prints up to 17" wide × 35" long. The 4½" diameter finely-machined solid upper roll may be raised to accommodate mounted linoleum up to 7/8" thick. Total clearance without blanket is 1¼". It is gear driven for easy pulling of etchings, dry points, engravings, collagraphs, linoleum block prints, and paper plate lithographs. Calibrated pressure adjusters allow you to see exactly how much pressure is being applied. The press comes with a ½" thick phenolic bed plate, 19-5/8" wide × 36" long — 1-5/8" wider than the original 999 press. The phenolic bed plate is a lightweight, non-porous, non-compressible material that will not rust. A ¼" thick gray cushion blanket also comes with the press. We recommend the purchase of a catcher blanket and a pusher blanket. Weighs 171 lb (78 kg).